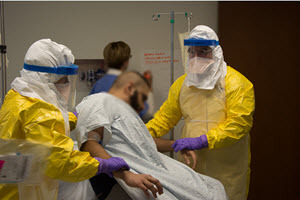 In collaboration with UPMC clinicians, infection control personnel, patient safety and waste management specialists, WISER and UPMC have developed an Ebola Response Team Training course. The course, Clinical Response Team Training (CRTT), was developed to train response team members in the initial and long term care of patients with highly communicable diseases. Staff were trained to function in Level II personal protective equipment (PPE), focusing specifically on heightened awareness of PPE, procedural practices and breech avoidance. In preparation for their training, team members are given access to online content, through the WISER learning management system, which covers the pathophysiology of Ebola, response team roles and goals, waste management and a series of references. The onsite portion of the course taught participants the intricacies of the response team responsibilities from activation to self-care. For additional information, please contact wiserhelp@upmc.edu.